I try to style my work wardrobe to lean more Marnie from Girls and less Emma from Glee. However, there is nothing, and I mean NOTHING, that looks both as cute, and as professional as the perfect cardigan. Like the classic LBD, or those impeccable heels, a great cardigan is a professional closet requisite. I have been in search of the cardigan for years. J Crew’s jackie cardigan was my top contender for some time. I bought an olive green version on Michigan Ave., in Chicago while shopping with a friend one crisp October afternoon. That was around four years ago, and although I’ve worn it unceasingly to work since, and the cuffs are beginning to show the wear, it still hangs in my closet and I can’t seem to get rid of it. It should be noted, that I also purchased a full cotton version of a j crew cardigan, however it stretched after a few wears and now looks loose and baggy in places. Next, I tried to replicate my love for the jackie with a deep purple cotton and wool blend cardigan from Gap. Although it was a cute sweater, after a few washes it just did not hold its shape like the j crew version. It appears appealing when buttoned over a blouse, but does not have that classic adorable cardigan shape I’m after. Well, I’ve recently found the next great cardigan! I was walking through the mall when a rack of colorful sleeves and buttons caught my eye. Halogen brand has a great line of cardigans in a myriad of colors (they also have some delectable skirts as well). The only down side for this busy girl, is that they need to be hand washed. * They are made of rayon, so they are very light weight and hold their shape wonderfully over any shirt, top or blouse. The saturated, deep colors really make them pop, so it’s easy to throw one on over those plain black trouser pants and basic white shirt. I now have five in different colors! I didn’t think that I could devote an entire post to sweaters, but with fall coming sooner than I’d like, it’s almost time to dig out the cooler wardrobe. Sigh. * This can be done with a little woolite in your bathroom sink. Did you guess Autumn? Winter? Well, you would not be wrong, but Spring and Summer are also correct. With the advent of air conditioning, and current popularity of vivid colors, traditionally cool weather garb is now fair game in the most humid of months. I work in an office setting where sitting many hours a day can be the norm. On the one hand, I’m assuming this is terrible for my posture. On the other, it leaves open the option to wear many great ‘sitting’ shoes. (There are two kinds of shoes – sitting, and walking. Walking shoes are those comfy flats you know you can trek to the train and back in. Sitting shoes are those adorable slingbacks with the altitudinous heels that look amazing until you attempt to stand up!) While I often opt for sandals in summer, neon and patterns add some sunny flair to a pair of pumps. Let’s talk jackets. I know, I know, wearing a jacket in summer sounds crazy, but hear me out on this one. 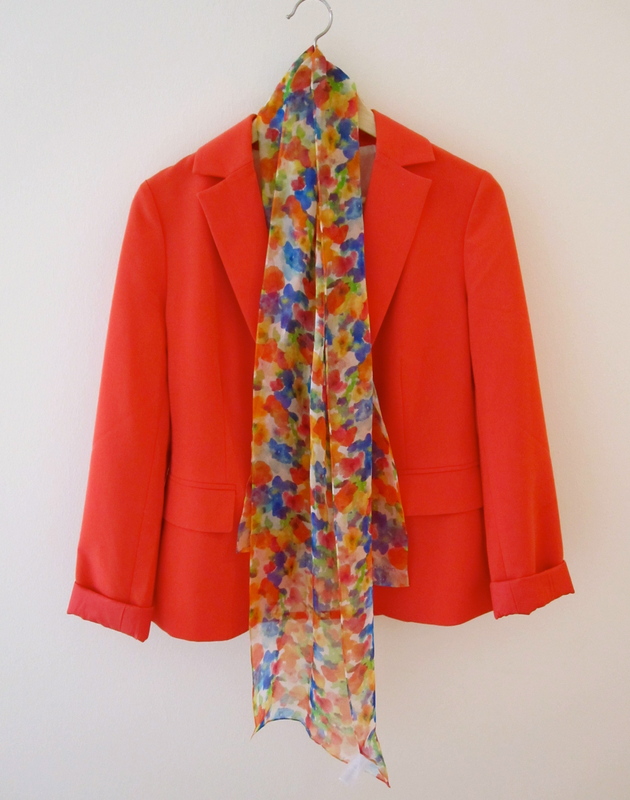 Choosing a blazer or a jacket with the right bright hue will make a formerly winter look fit right in during August. Throw in a beautiful, jazzy scarf like this kaleidoscopic silk (gift from my sister!) and you can’t be beat by the heat. Blazer by Forever 21. Calvin Klein scarf. 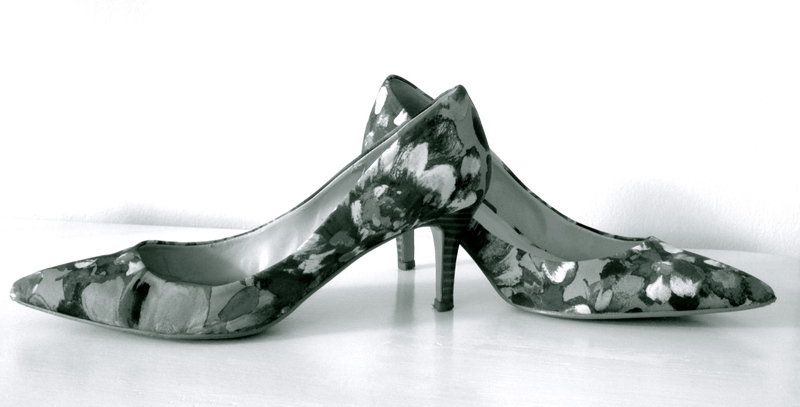 Shoes by Nine West.